Dorothy Esther Griffiths (1903-2003) was head teacher of Landbeach village school from 1947 until her retirement in 1958. She was much-loved in the village and, with the help of the Rector, succeeded in keeping the school open, although it closed after they had both left the village. In 1993, for Mrs Griffiths’ 90th birthday, her daughter Hilary Rose brought three members of her family to Landbeach to ring a quarter peal of Plain Bob Minimus, conducted by Mike Purday. Hilary rang again in June 2003 to celebrate her mother's 100th birthday. One of the ringers on that occasion was Neville Diver, who had been taught by Mrs Griffiths in Landbeach. In October that year Mrs Griffiths died and Hilary rang again for her funeral at Landbeach, where she is buried. By 2013, Hilary and her husband Mike were unable to make the trip from Sketty (near Swansea) to ring for her mother’s 110th anniversary. 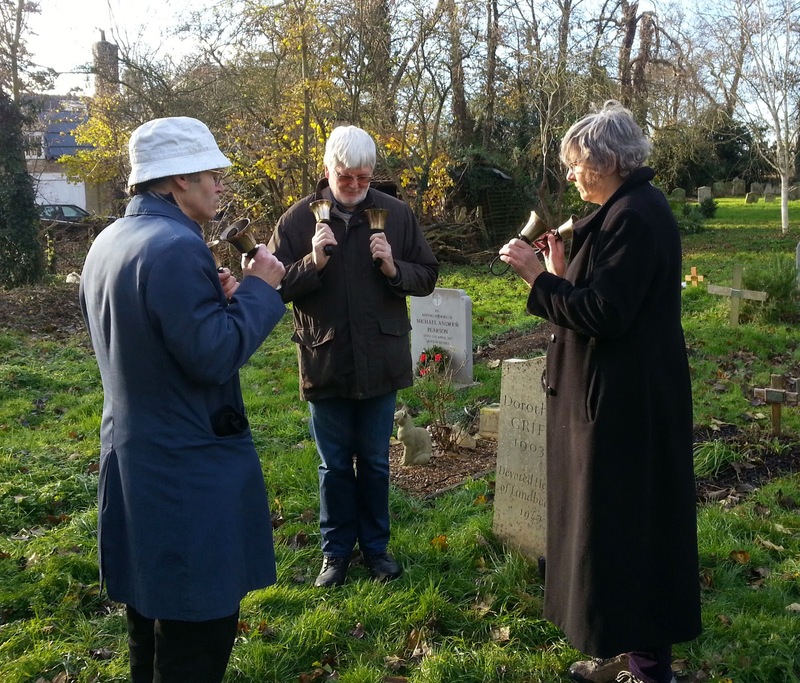 Instead, the Landbeach Bell Ringers rang handbells around Mrs Griffiths’ grave on Sunday 8th Dec. The children rang named changes on 8 and the adults rang a plain course of Plain Bob Minor. Hilary’s son Richard Rose joined us, and he writes: “It was so kind of you all to give up your time, and I am sure was something that Gran would have been very pleased to see happen in the village she loved so much.” Mary Barber, another daughter of Mrs Griffiths, was unable to be present, but she and her husband Chris met some of the ringers when they visited Landbeach church later that week.